Some mushrooms appear only in years with late soaking rain, others only when there is an early rain followed by a dry spell followed by another rain. Some mushrooms only grow where there is something dead under the dirt, while others cannibalize nearby poisonous mushrooms, transforming them into prized edibles. It is a strange and unpredictable world, that of the mushroom hunter. And so it is that we depart each late fall or early winter for our yearly holiday visit to see my mother and other family in the mountainous forests of Northern California’s Sonoma County, uncertain what we will find growing amidst those trees. Last year, for example — one of the driest on record — we went up at Thanksgiving and found nothing, where normally we might’ve found porcini and chanterelles, among others. This year, we arrived in the week before Christmas. They’d had ample rainfall already, and my mother told me there were mushrooms everywhere. Indeed, my first stroll outside our first morning there revealed signs of tantalizing promise — tiny, delicious candy caps growing from the moss along the driveway. A short walk up past the badminton court and I was rocked — matsutake, several large mushrooms, one of my most favorite fungi! On closer inspection, these mushrooms had been open awhile, had been rained on, and were clearly past their prime. But this was an area where they rarely ever even grew, which meant that further up the hill I was likely to hit the jackpot. 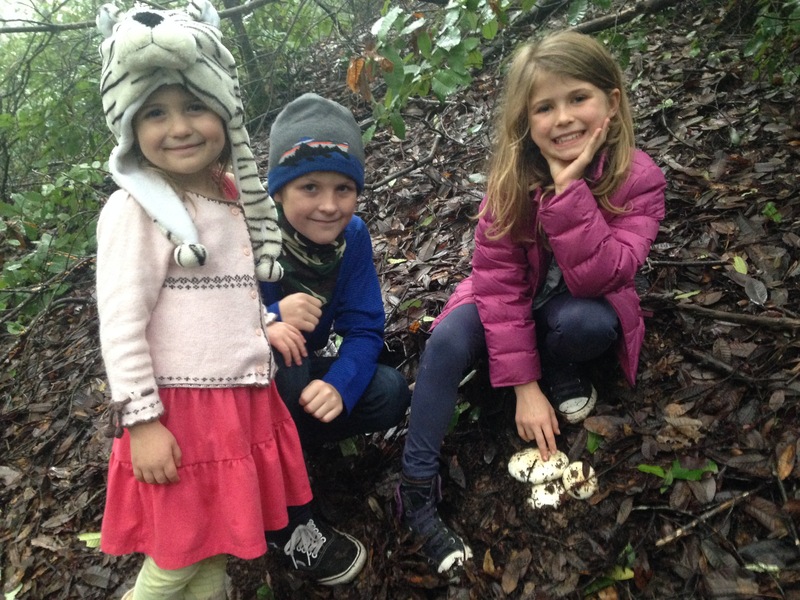 I gathered my wife and kids — excellent mushrooms hunters one and all (the kids in particular, possessing sharper eye sight and being closer to the ground) — and headed up the mountain. Soon enough, we had found more matsutakes — perfect ones, firm and clean, just emerged from the earth. I trained my kids to spot “shrumps,” tell-tale bulges in the leafy duff — “mushroom humps” — where a large cap hadn’t yet broken the earth. And they were a quick study. We were finding matsutakes everywhere we looked, where we had been standing right above them and hadn’t even seen them before. My wife took Immy, our 4-year-old, back to the house. It was drizzly and cold, and they were both satisfied with their haul. 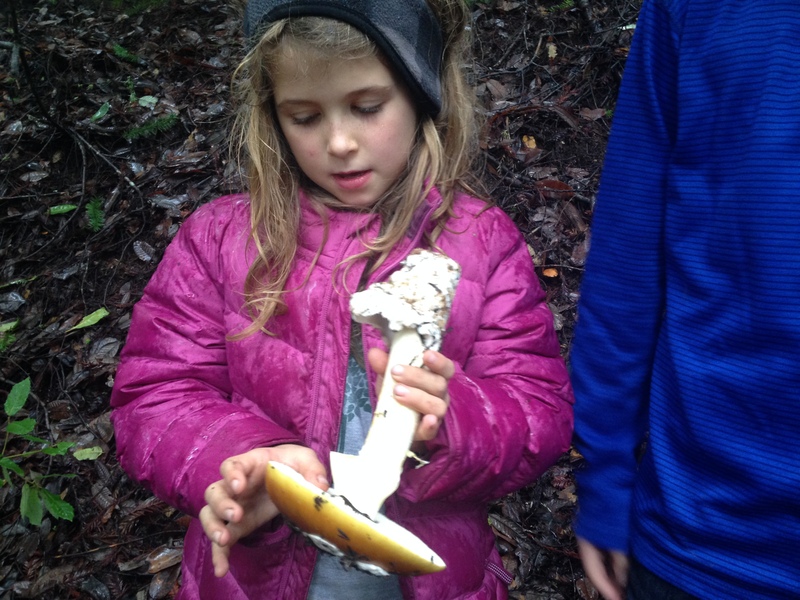 But the older kids and I continued on, and found more matsutakes in several different spots further up the mountain. After awhile, they too lost interest. “I don’t even care if it’s a matootakee,” said Willa, picking up a large white mushroom and chucking it against the side of the tree. We turned back home — we had well over 10 pounds, we didn’t need to be greedy. I like to cook matsutakes in a number of different ways — cream of matsutake soup, matsutake pizza, pasta, grilled Japanese style, etc. But perhaps my favorite way is tempura fried with a soy lemon dipping sauce. If you’ve got matsutakes (and I’m betting the ranch you don’t), give it a try. You could also have similarly excellent results with shimeji or enoki. Serve with chilled Japanese beer. *Note: the dashi broth, while not necessary, does add a delicious umami to the mushrooms. If you had trouble finding dried dashi broth, you could buy more readily available dried katsuo bonito shavings and grind them to a powder in a spice mill. Make your sauce: mix together soy sauce, lemon juice, water, garlic and sugar, stirring until sugar is dissolved. Heat vegetable oil in a wok or small saucepan over medium high heat until a drop of batter sizzles. Dip matsutake slices, one at a time, in the batter and drop into the oil, a few at a time. Fry until crispy and golden, about 1 minute per slice — turning once if needed — and remove with tongs to a paper towel-lined plate. Drain for a moment, and place on a plate in a 200-degree oven. Continue — dipping, frying, draining and plating in the oven — until all mushrooms are cooked. Sprinkle with salt and serve with dipping sauce. Last night I added some matsutake mushrooms to my crock pot roast Yum! Thanks for this post! I bet that was delicious! Thanks for stopping by! Great find Sean! The children are adorable. I have 5 ( 4 y.o. fraternal twins, 6, 8 and an almost 10 y.o. Birthday is very soon-Yikes where have the years gone?). Cheryl from sunny Florida. 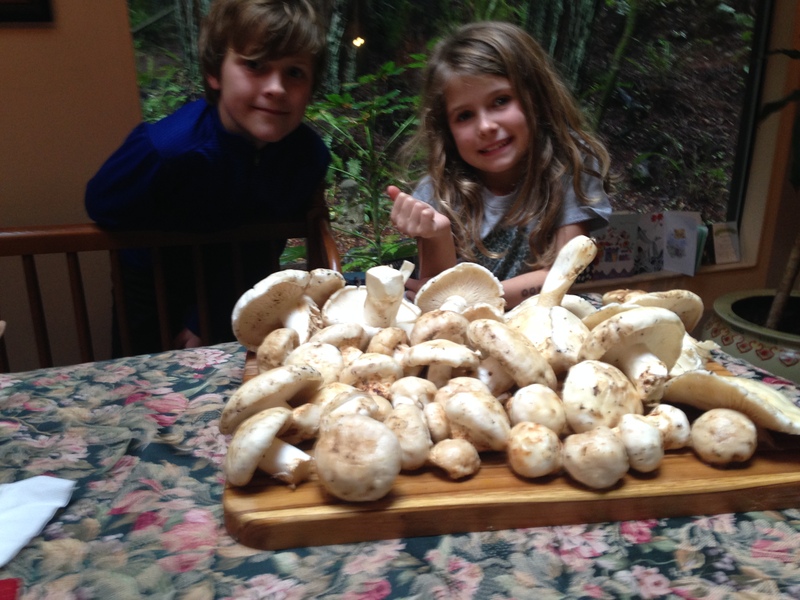 It’s going to be SOOOO funny when your kids start dating and it comes up that they are EXPERT wild mushroom hunters!! Oh, they don’t like it? What an odd name for a mushroom. Matsu is pine and take is bamboo. “Take” also means mushroom. Most of the Japanese mushrooms end with “take” — shiitake, matsutake (which grow near pine trees, i.e. “pine mushroom”), enotake, etc. Huh. I have been away for too long. OMG, it just occurred to me that they might think you are weird and eccentric. An older guy, Dad! Life is soooooo weird. I’m trying to teach them to snuff for truffles. But they don’t like having to put their noses in the dirt. Jealous! Everybody is always saying “I’m so sure you’ve got morels on your property.” But, after 20+ years, we’ve never found a single one. If you burned down all the trees on your property, then they would grow.